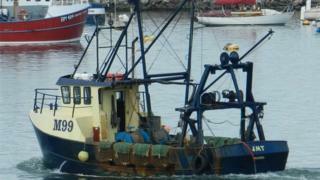 Two fishermen died when their trawler capsized "suddenly and without warning", an inquest has heard. Michael Hill, 22, and Shane Hooper, 33, were on board the JMT scalloper when it sank on 9 July 2015. A jury concluded a verdict of accidental death and found "multiple factors" caused the JMT to sink off Rame Head in Cornwall. Plymouth Coroner's Court heard of the Marine Accident Investigation Branch's recommendations for the future. The two day inquest heard the vessel was found on 10 July 2015, 51m (167ft) under water, 3.8 nautical miles off the coast. The body of Shane Hooper was recovered on the same day after being spotted floating in a life ring by the crew of a yacht. A year later, on 6 July 2016, the jaw bone of Michael Hill was recovered on the sea bed along with a wooden spirit level and metal plaque by another vessel dredging for scallops. The jury found the cause of death for skipper Mr Hill was unascertainable and the cause of death for crewman Shane Hooper was immersion in sea water. The jury said: "The deceased were fishing at sea on 9 July when multiple factors contributed to the instability of the JMT and caused it to sink." Sean Friday from the Marine Accidents Investigations Branch told the court the capsize happened "suddenly and without warning". Coroner Ian Arrow said: "I'm so sorry that these two men have died. I'm sure it was upsetting for you all." The Marine Accident Investigation Branch recommended the Maritime and Coastguard Agency introduce stability criteria for new and existing vessels under 15m in length. It also requested skippers of vessels under 16.5m should have to complete stability awareness training.